Pig farmers are responsible for the daily care and management of pigs raised for the pork production industry. There are three main types of pig farms, according to the United States Department of Agriculture (USDA). Farrow-to-finish farms raise piglets from birth to slaughter weight, which is usually 240 to 270 pounds. Feeder pig farms raise piglets from birth to somewhere in the range of 10 to 60 pounds, when they are sold to finishers. Finally, finisher farms buy feeder pigs and raise them to slaughter weight. Pig farmers manage the care of pigs that will eventually be slaughtered and processed for sale—often for large commercial operations that have thousands of animals on site. These large farms that specialize in one phase of pig growth and production are more prominent than farrow-to-finish farms, according to the USDA. Pig farmers also work closely with large animal veterinarians to ensure the proper health of their animals through vaccination and medication protocols. They may also consult animal nutritionists and livestock feed sales representatives while formulating diet plans. Revenues from a pig farm can vary widely based on production costs, weather conditions, and the market price of pork. A pig farmer’s salary can also vary due to the type of operation they work for (commercial or family farm), their level of experience, and the number of hogs managed. Unless that are employed by a corporate entity that pays them a fixed salary, pig farmers must also consider other expenses of running a farm when determining their final profits each year. These operating expenses may include supplies, feed, fuel, labor, veterinary care, insurance, waste removal, and equipment. Education: Nearly all pig farmers have (at minimum) a high school diploma, with many holding college degrees in areas such as animal science, agriculture, or a closely related field. Coursework for these degrees usually includes courses in animal science, production, meat science, anatomy and physiology, genetics, reproduction, nutrition, ration formulation, technology, business administration, and agricultural marketing. Experience: Many aspiring pig farmers are introduced to the industry through participation in youth programs such as Future Farmers of America (FFA) or 4-H clubs. These groups give young people the chance to handle an assortment of farm animals and compete with them in livestock shows. Valuable experience may also be gained through work on family farm operations. Physical stamina: Pig farmers must be able to be on their feet for long periods of time, lift, and bend—especially those working on small farms. Analytical skills: Pig farmers must monitor and assess the health of the hens and quality of the eggs they produce. 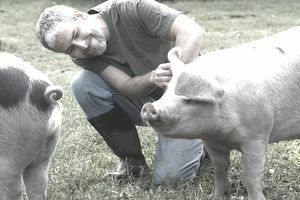 Interpersonal skills: Most commercial pig farms require many staff members, and often, pig farmers must be able to effectively supervise and work with others on the farm. The U.S. Bureau of Labor Statistics projects that the number of job opportunities for farmers, ranchers, and agricultural managers will decline 1 percent through 2026, which is slower than the overall employment growth of 7 percent for all occupations in the country. The USDA’s Economic Research Service has found that the total number of hog farms has decreased due to the consolidation of smaller operations into much larger commercial entities that specialize in one phase of production. The work of a pig farmer may involve being exposed to the elements and extreme temperatures from time to time, although commercial pig farming is generally conducted indoors in climate-controlled buildings. As with most farming and livestock careers, a pig farmer often must work long hours that include nights, weekends, or holidays.